DAWSON CITY – The Dawson dog yard became a lot quieter Thursday as 21 mushers left over the course of the day headed toward the border and the Eagle, Alaska checkpoint for the second half of the Yukon Quest. Up front, Brent Sass, the first to reach Dawson, led the leader pack into and out of Clinton Creek. However, he was passed by a surging Allen Moore and Michelle Phillips as they began the ascent of American Summit. Rookie musher and Dawson resident Jason Biasetti left for Eagle at 4 p.m. Thursday. He is currently sitting in the middle of the pack. Biasetti’s dogs were nestled snuggly in their straw, getting some well-deserved rest before they got back onto the trail. Biasetti left Dawson with 10 dogs. It’s his first time on the Alaskan side, but he knows what to expect. “I heard the trail is pretty good; we are going to be on the Yukon River for a while,” said Biasetti. “There is going to be windblown sections on the Yukon, which is common. There will probably be some snow drifting as well, which is also common. Biasetti said he is just going to take it one checkpoint at a time as he and his team head into the unknown. “I’m used to running a river, so I’m confident,” said Biasetti. “We got American Summit; I don’t know what that’s like. But we are ready, and we are just going to take it checkpoint to checkpoint. “I’ve still got the nervousness, and usually it disappears on the trail. “I guess it means so much to me, I put a lot of pressure on myself. But I’m loose on the trail and I’ve kept my dogs happy. When the Star spoke with Biasetti in early January, he said getting to the Quest was the realization of a 10-year dream. So far, it has matched his expectations. “Yeah, but I definitely faced some adversity in the first half I didn’t anticipate with my toe and some dogs,” said Biasetti. He suffered frostbite on his toe heading from Whitehorse to Braeburn and had to drop four dogs due to soreness. Chase Tingle may be a rookie to the 1,000-mile race, which began last Saturday in Whitehorse, but he has done the YQ300 on the Alaskan side. “Both sides are very challenging for different reasons,” said Tingle. Fellow rookie Hendrik Stachnau arrived in Dawson shortly after Tingle did. 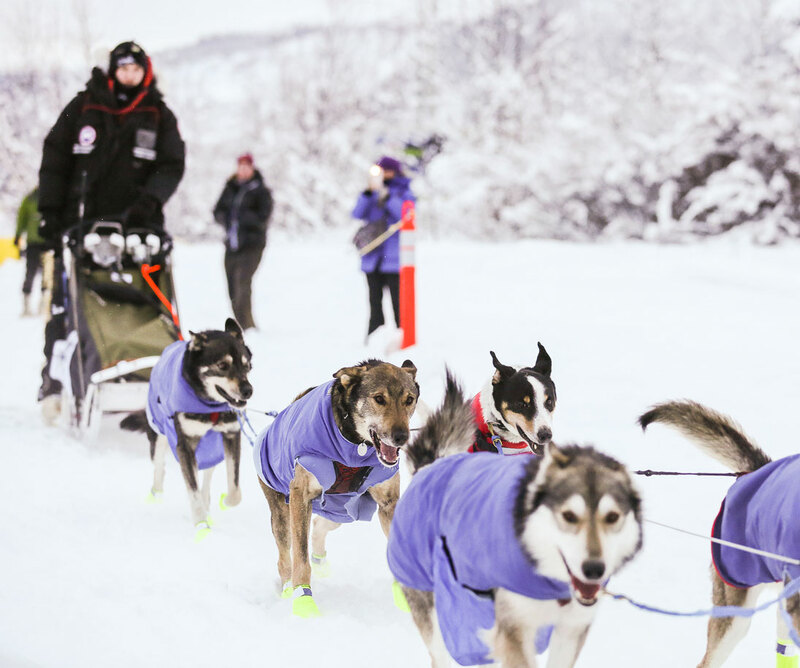 He’s racing with Greenland dogs and two Alaskan malamutes to show everyone that they’re capable of doing the Quest. “I want to show the native sled dog breeds,” said Stachnau. “The Greenland dogs and the Alaskan malamutes, they are quite unknown or used here at least at the Quest, or have never been used. Stachnau was told after the vet check in Dawson that he had the biggest dogs in the yard. “They just told me my dogs are the fattest dogs in the yard,” said Stachnau through a big laugh. “I said ‘No, it is just the hunger.’ She even has already been eating the lines. I have to go down in food a little bit or she can’t run in the night; she will have a belly hanging there. The race had its first scratches on Thursday. Rookie Jimmy Lebling pulled out close to 7 p.m., citing the well-being of his dogs. Also last evening, fellow rookie Olivia Webster turned back into the Dawson checkpoint after departing and made the decision to scratch. Potential Red Lantern recipient Lisbet Norris winner and her team began their 36-hour layover in Dawson shortly before 11 p.m. Thursday. As of this morning, according to the live race tracker, four mushers have departed Eagle headed toward Trout Creek. Moore and Sass are close together ahead of the pack. Gatt and Phillips are close together about five miles behind. Greenland Dogs and certainly not Alaskan Malamutes were never “designed” to be racing dogs! Greenland Dogs (a.k.a the aboriginal landrace Inuit Sled Dogs of Canada and Greenland) were, traditionally over thousands of years, not kept nor bred to put in the kind of speed or daily mileage as expected during a distance race like the YK. Using them as such proves nothing and takes them totally out of character. Alaskan Malamutes, originating from Inuit Sled Dogs and officially created in 1935 in Wonalancet, New Hampshire, quickly lost any vestiges of their aboriginal landrace progenitors, becoming more of a show dog and a pet. Even so, they were never meant to be a racing breed. Putting the landrace Greenland Dog and the cultured Alaskan Malamute is meaningless in the context of their origins and proves nothing. I question Hendrik Stachnau’s motivation for using them in this manner, especially if he is breeding them for the features that they were never meant to have.